Jackson Galaxy from Animal Planet uses these cat toys and highly recommends them for all cat lovers. The Da Bird cat toy is a pull apart wand that has a feather toy at the end. It is not just your ordinary cat wand. Cats go nuts for this. 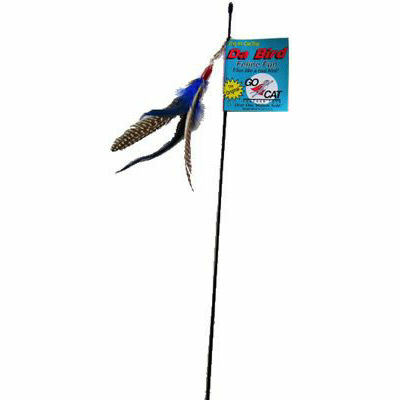 The action of waving the wand with the feather toy at the end mimics a bird in flight, so it brings out your cat's natural prey instincts. There are many different refills to put on the end besides the feather toy too. Each toy attaches easily with a cotter clip- kind of like a safety pin. There is Fur Fun, Sparkler, Kitty Puff attachments so you can rotate your toys. It's like getting a multitude of toys in one. 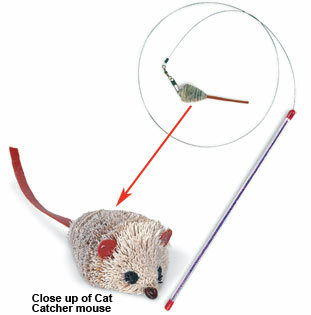 The Cat Catcher is a very durable wand with a pre-flexed wire attached. On the end is a very fancy corrugated mouse. Cats just love this. Be sure to get extra refills. Your cat will love to attack the mouse. Find all the Go Cat Toys- cat wands, catnip toys, fur mice, fur pong, feather pong, wobble mice and more at Mickey's Pet Supplies. Shipping is as low as $3.85 and we ship for free on your order of $75 or more. Mickey's Pet Supplies is a family owned company that truly cares about cats. Call 877-863-5431 anytime to order.